We want to make it easier to you manage your health and obtain important blood tests to manage your health and body goals. Through my partnership with Ulta Lab Tests, I can provide you custom wellness packages and comprehensive blood panels utilizing the Quest network of labs. Through this program you can identify risk factors of disease or adverse conditions that can help you take charge of your health. The Quest network’s labs offer a broad range of tests at discounted prices. All tests are confidential. Once you begin managing your own health and body needs, you will be surprised at how affordable being proactive in your health can be. Follow this link to Ulta Lab Tests. Did you know that you can control your health with early detection? It may sound like science fiction, but it’s resolutely rooted in the former and nowhere close to the latter. Create peace of mind by confirming that your biomarkers are normal and relieve any stress about the conditions for which you are tested. Track your biomarkers and your progress over time. Measure the effectiveness of the actions that you are taking to improve your health and wellbeing. Wellevate is the newest online patient dispensary from Emerson Ecologics. Imagine a new, safe and secure way for practitioners to connect with patients. Among its many features, Wellevate boasts functionality that allows practitioners to recommend products, share personalized information and ultimately build greater communication with their patients. So how does it work? Healthcare practitioners can offer a customized list of professional quality products through their online-patient dispensary, and then invite patients to wellevateSM, where they can conveniently purchase their individualized recommendations. Ordering and delivery are simple, ensuring the best possible customer service for you and your patients. Here at Wellevate we are focused on delivering the brands, resources & services to help support integrative health practitioners provide the best possible care to their patients. Our next generation online patient dispensary, Wellevate was designed based on feedback from healthcare practitioners and patients, like you, who highlighted the importance of a simple, easy to use tool that helped practitioners recommend the highest quality products for the best of health to their patients, simplified ordering, and ultimately helped improve patient’s ability to follow their practitioners recommended protocol. We also heard from you that privacy and security are vital in patient communications, so every transaction is safe and secure as wellevateSM is HIPAA and PCI compliant. 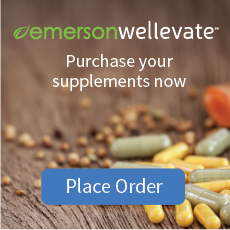 What’s more, Wellevate is backed by Emerson Ecologics’ amazing breadth of brands, industry-defining quality program, and exceptional customer service that professionals and their patients have trusted for years. After 30 years of delivering the highest quality products and services, we are excited to offer this best in class tool that serves both you and your patients in the most convenient way possible. Genomic Nutrition is a leading provider of comprehensive nutrigenomic supplements for the integrative healthcare professional to use with clients.